Mesmer had also studied music and played the cello and keyboard as an amateur. His Vienna home was the site of regular musical performances. 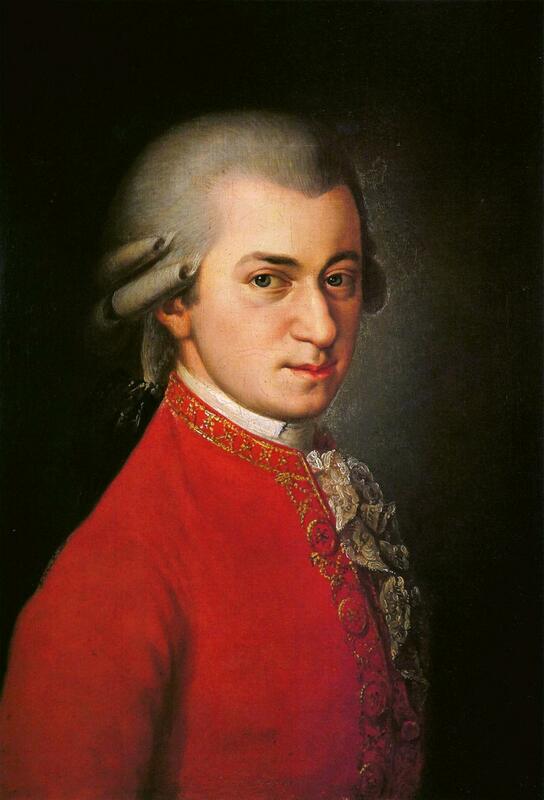 In 1768, when court intrigue prevented a performance of Mozart’s early opera La Finta Semplice, K. 51, Mesmer – already known to the Mozart family and a fan of the twelve-year-old composer’s music – arranged for a performance in his garden of Mozart’s singspiel Bastien und Bastienne, K. 50. Mozart and Mesmer maintained their friendship over the next several years. It is through letters exchanged between Mozart family members that details are known about one of the first successes of Mesmer’s animal magnetism treatment, Franziska Oesterlin, who later married Mesmer’s stepson. Another even more famous patient of Mesmer’s was Maria Theresia von Paradies. Blind from the age of three and a child prodigy, Paradies first met the young Mozart on one of his family’s journeys from Salzburg to Vienna. They played four-hand piano music together and became friends. Many years later, in 1784, Mozart wrote his Piano Concerto No. 18 in B-flat major, K. 456 for her to play during her concert tour of Europe and England. In the year 1777, Paradies had entered treatment with Mesmer. 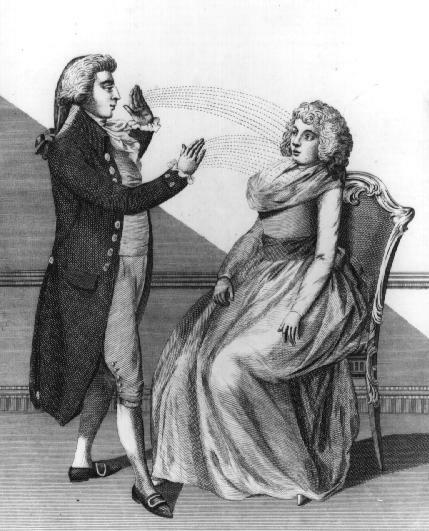 She had originally embraced music in part to distract her from the years of “treatment,” ranging from leeches and purgatives to electroshock, that she received in an attempt to cure her blindness. Mesmer was convinced that he could do Paradies, at that point eighteen years old, some good with his animal magnetism. And apparently he was right – within a few days the spasms she experienced in her eyes subsided, and in a few weeks some vision had returned. The scandal of these events was a public one and ruined Mesmer’s reputation in Vienna. In early 1778 he moved to Paris, where his treatments became very popular among the aristocratic class. As his successes accumulated, Mesmer grew desirous of official recognition from the French government. None was forthcoming at first. But then Marie Antoinette set up a commission to investigate Mesmer’s practice, which might have resulted in an annuity and official government sanction. Eventually, four members of the Faculty of Medicine – supplemented by five members of the Royal Academy of Sciences, one of whom was Benjamin Franklin – examined treatments given by one of Mesmer’s disciples, Dr. Charles d’Eslon. The reports were not favorable to Mesmer, and before long he was forced to leave Paris. For the remaining years of his life he traveled widely, occasionally practiced his treatments, but mostly lived a quiet, uncontroversial life. 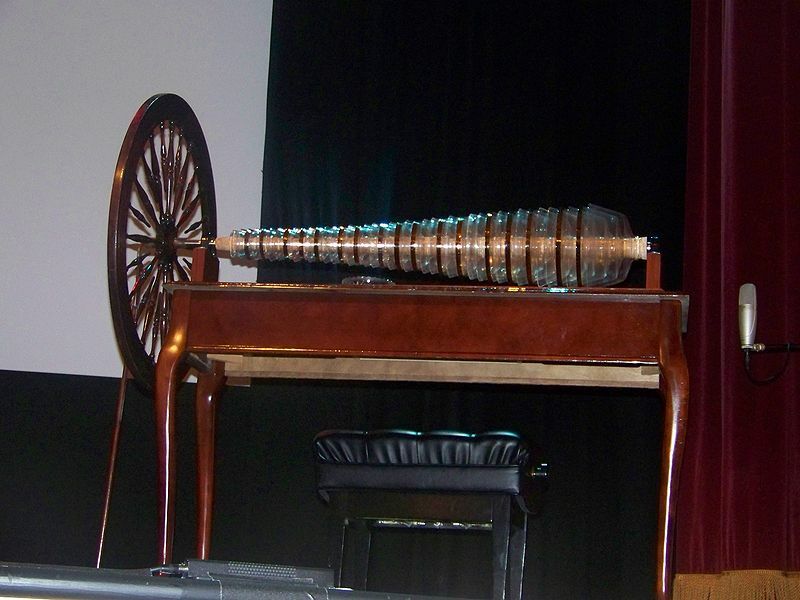 One of the things that Mozart, Mesmer, and Benjamin Franklin had in common – aside from the fact that they were all Freemasons – was a musical instrument, the glass harmonica. Also known as the glass armonica, bowl organ, hydrocrystalophone, or just armonica – the word hydrodaktulopsychicharmonica, which translated from Greek means something like “harmonica to produce music for the soul by fingers dipped in water,” has also been used – the instrument produces sound through the rubbing of glass or crystal bowls. Traditionally credited as the instrument’s first virtuoso is Richard Poekrich, a native of Ireland who became familiar in 1740s London for his playing of a set of wine glasses filled with varying levels of water. 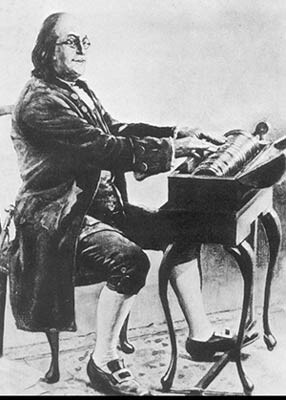 In 1761, while living in England, Benjamin Franklin heard an unusual musical performer named Edmund Delaval. Franklin wrote, “He collected a number of glasses of different sizes, fixed them near each other on a table, and tuned them by putting into them water, more or less as each note required. The tones were brought out by passing his fingers round their brims.” Later Franklin came up with own instrument design to produce a similar sound. He had a glass maker create 37 glass hemispheres, each of which produced a different pitch based on its size and thickness. An iron shaft ran through them all, and was connected to a wheel that would spin propelled by a foot pedal. The performer would play the spinning glass hemispheres with moistened fingers. Franklin became an able performer on his new instrument, and played it at dinner parties for friends. Within a short time others started to play the instrument, and its popularity spread. As was the case with the harp back then, most glass harmonica players were women. Perhaps the best known was Marianne Davies, who performed concerts all over Europe. Sometime in the late 1760s or early 1770s, Mesmer acquired his first glass harmonica. He became quite a virtuoso on the instrument, often performing during the musicales at his Vienna home. 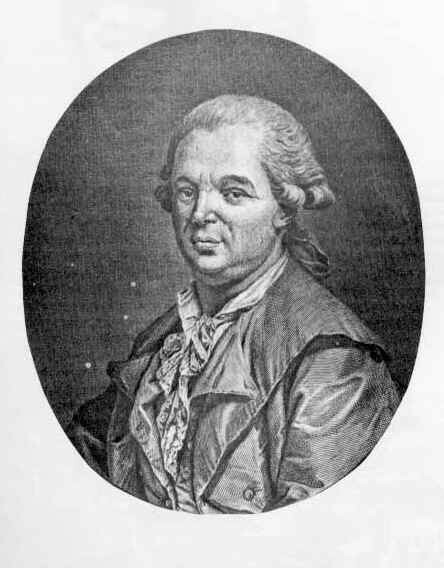 The glass harmonica also became an integral part of his medical treatments, its vibrations promoting both a hypnotic state in his patients and an effective atmosphere for the transmission of animal magnetism. Ludwig van Beethoven (in the incidental music for the play Leonore Prohaska, WoO. 96), Richard Strauss (in the opera Die Frau ohne Schatten), and dozens of other composers have written for the glass harmonica. Gaetano Donizetti considered including one in the famous “Mad Scene” in his 1835 opera Lucia di Lammermoor, and it is said that the celesta part in Piotr Tchaikovsky’s famous “Dance of the Sugar-Plum Fairies” from The Nutcracker was originally conceived for glass harmonica. In the last months of his life, Mozart wrote his only pieces for glass harmonica for a performer he’d recently met in Vienna, Mariane Kirchgessner: the Adagio, K 617a for the instrument alone, and the Adagio and Rondo for glass harmonica, flute, oboe, viola and cello, K. 617 (his last chamber music composition). It should be no surprise that, even given the relative novelty of the instrument, Mozart was able to write something melodically exquisite, and well-suited to the sustained tones of the glass harmonica. Here are two videos: the first features K. 617a on the original style of glass harmonica, and the one below that the Adagio from K. 617 played on Benjamin Franklin’s version of the instrument. Thanks to the extremely interesting glassarmonica.com website for some of the information used in this post.